We call our home real estate market the Greater San Francisco Bay Area, as some of our employees live on the Peninsula, a few minutes from San Francisco, others along the Monterey Bay and our HQ is in Santa Cruz. This is a territory of 50+ miles radius with common real estate market characteristics of very limited real estate inventory and very high real estate prices (in absolute and relative terms). It’s a seller’s market. Impressing current seller can lead to listing referrals: We heard of many stories and saw it first hand how a proper listing marketing process impresses the current client, who will then be way more likely to refer you to friends and family. Just make sure that the seller knows that you invest in his marketing whether it’s a seller market or not, and demonstrate all that you do for them online and offline. Impressing neighbors can lead to listing referrals: Listing marketing technologies used at the house, including for example our RealBird SMS text code marketing can make neighbors notice your efforts. In a seller’s market where the perception is that anyone can sell a properly priced home, this may very well be the differentiator that you need to win the next listing. It makes you stand out of the crowd. Nothing is more convincing than professionals who walk the extra mile. Growing your buyer side business: The more private-labeled technology you provide with your listing marketing, the bigger the chances of double ending your transactions. While double ending transactions may or may not be part of your business practice, getting buyer leads while selling a property ensures a healthy lead pipeline for future transactions by growing your prospective buyers database. Create single property websites for your current and past properties to impress the current seller and build and compound your online footprint. Make sure you let your seller know about it and share it with neighbors too, if possible. Use our new all-inclusive Homes By SMS sign riders in front of your current property for sale and provide SMS mobile access to property information. You will impress your current seller, the neighbors and can capture buyer leads for future transactions during, before and after business hours. Automatically, 24/7. 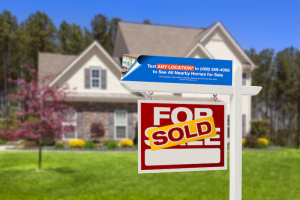 We’ll be writing more “Questions answered” type posts in the future, but we thought highlighting the benefits of listing marketing on a seller’s market might be a good start. What do you think? Should you have questions about the new Homes By SMS text code marketing service for listing promotions and buyer and seller prospecting, please don’t hesitate to contact us.